Above, the TCA cycle – click to enlarge to a legible size. 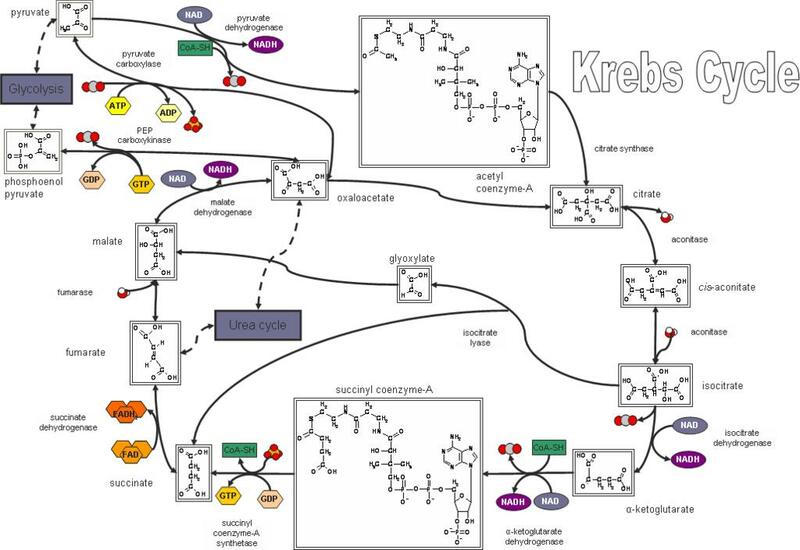 The Krebs, or citric acid cycle is important in aerobic organisms as part of cellular respiration by which carbohydrates, fats, and proteins yield energy, H2O and CO2. Each cycle produces 3 CO2, 4 NADH, 1 FADH2, and 1 ATP from a molecule of pyruvate. Those reactions that converge on the citric acid cycle to 'fill up' intermediates are called anaplerotic reactions. Following glycolysis, in which glucose is converted to two molecules of the intermediate pyruvate, the TCA cycle is the second of three metabolic pathways involved in catabolism of fuel molecules and ATP production. The third pathway is oxidative phosporylation. Four reactions are classed as anaplerotic, although the production of oxaloacetate from pyruvate is probably the most important physiologically. Bacteria and some species of higher plants are able to obtain a net increase in malate or oxaloacetate through expression of enzymes of the glyoxylate cycle or glyoxylate shunt. Two acetyl CoA are input per glyoxylate cycle with no loss of CO2, making possible net synthesis of a 4-carbon product. The two additional enzymes that permit the glyoxylate shunt are isocitrate lyase and malate synthase. The enzyme pyruvate carboxylase stimulates the TCA cycle by replenishing or increasing the overall available oxaloacetate supply. Because pyruvate dehydrogenase is irreversible, oxaloacetate cannot be synthesized from acetyl CoA. The two enzymes, pyruvate carboxylase and pyruvate dehydrogenase, control the supply of pyruvate, and are themselves reciprocally regulated. NADH and acetyl CoA are activators of the pyruvate dehydrogenase (protein) kinase, which in turn reduces the pyruvate dehydrogenase activity by phosphorylating key serine residues. High energy states favor pyruvate carboxylase by shifting the equilibrium toward CO2 activation, but inhibit pyruvate dehydrogenase, reducing levels of acetyl CoA. Conversely, low energy states favor pyruvate dehydrogenase and increase conversion of pyruvate to acetyl CoA. Citrate Cycle Enzymes: Citrate synthatase, aconitase, Isocitrate dehydrogenase, Alpha ketogluturate dehydrogenase, Succinyl CoA synthetase, Succinate dehydrogenase, Fumarase, Malate Dehydrogenase: mnemonic: "Corrupt Anti Intelligence Agent Spoke Slander For Money." A case study of endosymbiotic gene transfer. modified: The citric acid or tricarboxylic acid cycle is a central element of higher-plant carbon metabolism which provides, among other things, electrons for oxidative phosporylation in the inner mitochondrial membrane, intermediates for amino-acid biosynthesis, and oxaloacetate for gluconeogenesis from succinate derived from fatty acids via the glyoxylate cycle in glyoxysomes. The tricarboxylic acid cycle is a typical mitochondrial pathway and is widespread among alpha-proteobacteria, the group of eubacteria as defined under rRNA systematics from which mitochondria arose. Most of the enzymes of the tricarboxylic acid cycle are encoded in the nucleus in higher eukaryotes, and several have been previously shown to branch with their homologues from alpha-proteobacteria, indicating that the eukaryotic nuclear genes were acquired from the mitochondrial genome during the course of evolution. Here, we investigate the individual evolutionary histories of all of the enzymes of the tricarboxylic acid cycle and the glyoxylate cycle using protein maximum likelihood phylogenies, focusing on the evolutionary origin of the nuclear-encoded proteins in higher plants. The results indicate that about half of the proteins involved in this eukaryotic pathway are most similar to their alpha-proteobacterial homologues, whereas the remainder are most similar to eubacterial, but not specifically alpha-proteobacterial, homologues. A consideration of (a) the process of lateral gene transfer among free-living prokaryotes and (b) the mechanistics of endosymbiotic (symbiont-to-host) gene transfer reveals that it is unrealistic to expect all nuclear genes that were acquired from the alpha-proteobacterial ancestor of mitochondria to branch specifically with their homologues encoded in the genomes of contemporary alpha-proteobacteria. Rather, even if molecular phylogenetics were to work perfectly (which it does not), then some nuclear-encoded proteins that were acquired from the alpha-proteobacterial ancestor of mitochondria should, in phylogenetic trees, branch with homologues that are no longer found in most alpha-proteobacterial genomes, and some should reside on long branches that reveal affinity to eubacterial rather than archaebacterial homologues, but no particular affinity for any specific eubacterial donor. 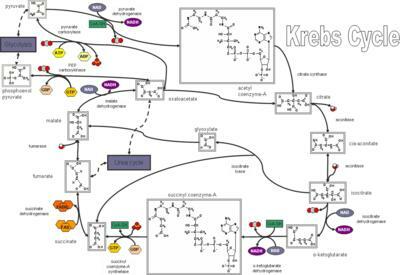 Schnarrenberger C, Martin W. Evolution of the enzymes of the citric acid cycle and the glyoxylate cycle of higher plants A case study of endosymbiotic gene transfer. (Free Full Text Article) Eur J Biochem. 2002 Feb;269(3):868-83. FEBS.